2) They had a profound impact on me, as a person. Seeing what you see there, both from the people you visit and from others, will change anyone with a heart. I just received a link to a powerful, four-and-a-half minute video from the Cleveland Clinic that makes this point in a way that will resonate with anyone who has ever visited someone in a hospital. In truth, the message would apply in an office building, school or shul, but it certainly 'works' in a hospital. I hope it is meaningful for you. For me, it's a midos booster shot. * The Zohar is cited by some as the basis for an argument that one can fulfill the practice of having a third meal on Shabbos by hearing a shiur. Supposedly, this idea was put forth before the Brisker Rav, who replied with something along the lines of, "You can shlug up (refute) a shiur, but you can't shlug up a piece of fish." The same is true for acts of chesed; an insight I offer in a shiur may be right or wrong, but chesed is always chesed. I get to spend time with the rebbetzin and my kids, especially on the long Pesach afternoons (yes, DST is appreciated here). Even with a nap, there’s still plenty of time left. I love the taste of Shmurah Matzah. Davening doesn’t involve the distracting complexities of Succos – no hoshanos, no naanuim, etc. No meetings on Chol haMoed. It’s corny, but connecting with thousands of years of Jewish history at the Seder is really amazing, if you stop to think about it. Yehoshua did it, they did it in Bnei Brak, they did it in Turkey and Spain and France and Yemen and Iraq and Iran and Brazil and Japan, and here I am doing it now. I can sit down to meals and eat and talk with my family without feeling rushed to go do work. I enjoy lounging in my kittel. Matzah with butter. Matzah with jam. Matzah with butter and jam. Matzah with scrambled eggs. Matzah with cheese. Matzah with schnitzel (but no cheese). Matzah with meatballs. Matzah with turkey. Matzah Matzah Matzah. Dayyenu is the perfect time to stop and think about all the little things that go right each day, to enable us to survive. That sounds corny too, but it’s true. There’s a great sense of accomplishment that comes, for me, if the seder goes well. The anticipation of post-Pesach ice cream is delicious. And for me, the high point of Pesach: Shir haShirim (Song of Songs) is beyond my ability to describe, it’s so passionate, so evocative, so wondefully descriptive of the beauty and pain of seeking Gd. As frightened as I get reading Koheles (Ecclesiastes) on Succos, that’s how inspired I am by reading Shir haShirim. I get teary every time I read the 5th chapter, especially, it’s just so heartwrenchingly beautiful, first the loss of Gd and then the description of Gd. There are no words in my lexicon. Matzah Matzah Matzah Matzah Matzah! During the past few decades, numerous changes have been proposed for the role of women in Orthodox public prayer. These include women's tefillah groups, women's Torah readings, women leading Kabbalat Shabbat and Psukei d'Zimra, and women's aliyot in the context of partnership minyanim. One set of arguments surrounding these changes is technical - what is permitted, what is prohibited, and so on. The other set of arguments looks at the mechanisms of change, and the ramifications of change - slippery slope, motivations, strife, speed of change and so on. I find these arguments and counter-arguments interesting, but they are scattered across blog posts and articles, with considerable overlap as well as conflict. Recently, I presented a shiur for avreichim in our Beit Midrash on these change-related arguments, and I tried to organize the positions, listing sources for the argument as well as opposing the argument. Here is the chart I used for the shiur, grouping the change-related arguments into five categories. I hope that this will be useful for people. Note: I am not saying whether I agree with any particular argument brought here. CATEGORY 1: Where will this lead? Slippery slope – Once you change this, what's next? CATEGORY 2: Is this change justified? Is the motivation positive, and addressing a real need? CATEGORY 3: Danger to a woman's "true role"
More than four years ago, I blogged about my father's first-cousin, Jacques Torczyner, here and here. I greatly regret to inform you that he passed away a week ago. Urbane, multilingual, well traveled, Jacques Torczyner came across as a citizen of the world. He was. Yet his life’s work focused on one place, Israel, and one cause, Zionism. With Torczyner’s death March 7 in Saratoga, the world lost one of the last pioneers of modern Zionism. He was 98. The Belgian native spent many evenings in his youth at the feet of Zionist visionaries. He later fled Hitler for the safety of America, where he rallied Jews to the cause of a Jewish state. He spent the rest of his life stirring others to align with Israel. Torczyner grew up in Antwerp in a strongly Zionist household. His father was president of the Belgian Zionist Federation, and their home was a mandatory stop for Jewish leaders from Palestine, among them Nachum Goldman and Chaim Weizmann. Soon after Germany invaded Belgium in May 1940, Torczyner and his wife, Berthe, as well as members of their extended families, fled to France, then Spain and, eventually, to Cuba. Once they obtained visas, the couple settled in Manhattan, living in a cozy West Side apartment for 55 years. The sages of the Talmud describe all sorts of experiences with sheidim – creatures which are neither human nor beast, which may or may not be visible or tangible, and which affect our world in numerous ways. The term sheid is often translated, unsatisfyingly, as "demon". I have heard all sorts of explanations for the nature of sheidim, including the idea [attributed to Rambam, as you will see below] that sheidim are an outdated superstition, but none of the explanations suits the canon of sheid-related material in the writings of the sages. "The statement in Avot d'Rabbi Natan 31 is known, that all that exists in the universe exists in man. The reverse is also true. "The power of imagination is found in Man. With this power, Man designs for himself a reality which does not exist, at all, in the universe; this exists only in the realm of imagination. Since this power exists in Man, its parallel must exist in some creature in the universe. Those creatures are the ones called sheidim – theirs is an existence which is not an existence. "When we say of something that it is only imagination, we mean that nothing like it exists in reality. However, certainly, for one who deals in human psychology, when he investigates the activities of the human brain, for him this imagination is certainly full-fledged reality. "Thus, it is appropriate that Rambam wrote (Commentary to Mishnah Avodah Zarah 4:7) that sheidim do not exist in reality, and this does not contradict, at all, the declarations of our sages which indicate the existence of sheidim." במאמרי חז"ל מצינו כמה פעמים ענינים מורים על מציאותם של שדים. ומהלך הסברה בזה הוא דידוע מאמר אדר"נ פל"א שכל מה שיש בעולם יש באדם. והוא הדין לאידך גיסא. והנה באדם נמצא במוח כוח הדמיון, שבכוח זה האדם מצייר לעצמו מציאות שאינה מצויה בכלל העולם. וה"ז מציאות רק בכוח המדמה. ומכיון שישנו כוח כזה באדם, בודאי שנמצא דוגמתו בריה בעולם. הבריות הללו הם הם הנקראים שדים. כלומר, שהם מציאות-בלתי-מציאות. והנה באמרנו על איזה ענין שאין זה אלא דמיון, כונתנו שאין דבר כזה במציאות. אבל מי שעסקו הוא בכוחות הנפש של האדם, בודאי שבשעה שהוא חוקר את הנעשה במוחו של אדם, בודאי שבשבילו הדמיון הזה הוא מציאות גמורה. ולהכי שפיר כתב הר"מ (פיה"מ ע"ז ד) דשדים אינם במציאות כלל. ואין זה סותר כלל וכלל לכל המאמרים המורים על מציאותם של שדים. 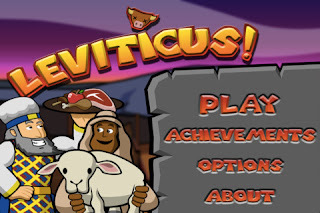 A company called "G-dcast" has come out with an app called "Leviticus!" Sharpen your knife and your priestly reflexes: are you ready for the Ultimate Rule Book? Leviticus! Play the role of a busy priest working to keep God happy by sacrificing choice offerings of sheep, goats, and bulls with frantic speed and slicing precision. Combo your actions and the rewards get BIBLICAL! Three sacrificial services a day, seven days a week. Can YOU make it to Shabbat? Download Leviticus! and start swiping to find out! Leviticus! features global leaderboards, long term achievements, and high score announcements designed especially for Facebook bragging. Cool in-app purchases coming soon! So many sacrifices, so little time! 1. We've chosen, for understandable educational reasons, to withdraw and live in exclusively Haredi cities and neighborhoods, avoiding as much as possible any social contact with the secular. This is legitimate and understandable, but as a result they don't really know us, amd so they naturally view us as bizarre, in our manner of dress, our behavior, and our language. This creates aversion and alienation. Why, then, we are angry at them for treating us this way? 2. We chose, for educational reasons—although some of us really believe it—to teach our children that all secular Israelis are sinners, vacuous, with no values, and corrupt. This could possibly be a legitimate view, but, then, why are we shocked when the secular, in return, teach their own children that the Haredim are all primitive, with outdated and despicable values? 3. We have chosen, for the sake of the preservation of Torah in Israel, to prevent our sons from participating in carrying the heavy burden of security, and instead tasked them with learning Torah. Of course we could not give that up, but why are we outraged and offended when the secular, who do not recognize nor understand this need—or rather most of them are familiar with the issue, but argue that there should be quotas—see us as immoral, and some despise us as a result? Naturally, his article - the rest of which is available here - was a big hit among critics of Hareidi society. However, I wonder: What would appear in an article entitled, "12 Good Reasons Why Haredim Reject Modern Orthodoxy"? I have a few ideas, but I'm more interested in yours: What do you think would belong on the list? Here is the derashah I plan to deliver this Shabbos; if you have any he'arot, please send them before Shabbos! In his youth, Moshe dwells in Pharaoh's palace. As an adolescent, Moshe is forced to flee to Midian – where he marries Tzipporah, a woman from a pariah family. Moshe returns from Midian to a nation that possesses neither the strength nor the patience for his religious mission; they wished he would return to Midian and leave them in their slavery. He is a wrathful judge, ordering the execution of thousands of people who had worshipped the Calf. He is a spiritual outsider, a pious third party pleading with G-d on behalf of the sinful Jews. He is a physical outsider, moving his tent beyond the tribal perimeter, a leper of sorts. He is distanced from his students, wearing a veil to obscure his radiance when teaching them. He is even distanced from family; as the midrash explains, he separates from his wife, Tzipporah. Moshe was upset that he had not personally taken part in actually building the Mishkan… Because Moshe was upset, Gd hid information from the people and they could not make the Mishkan stand… until Gd told Moshe, "Because you were upset about not having an active role in the work of the mishkan, therefore, those craftsmen could not assemble it in your place." Like Yonah camped outside of Nineveh, like Eliyahu living in the wilderness, Moshe had been excluded from the people he had led out of Egypt and had saved from Divine wrath. Perhaps Moshe now wishes to re-join the nation, via the symbolic act of participating in the construction of the Mishkan. However, this midrash requires deeper examination, for that cannot be the whole picture of Moshe's intent. The midrashic image of Gd watching the Jews blunder about clumsily like the Three Stooges, putting up walls and having them collapse, is amusing (if theologically disturbing). But the idea that spiritual Moshe, who just spent many weeks atop Sinai without eating or drinking, now wanted to engage in physical construction, is intriguing. Is he a forerunner of A.D. Gordon and Labour Zionism, insisting upon working with his hands? If not, why is this, the act of building the mishkan, the moment that Moshe seizes to re-join the community? Let's make the question stronger – Why does Gd permit Moshe to join the Jews who had worshipped the Calf? Moshe is meant to be apart, veiled, separate even from his wife! Recall that G-d did not speak to Avraham as long as he lived with Lot, or to Moshe as long as he was in idolatrous Egypt - why would Gd now want him to be with idolaters? Why does Moshe belong at the site of the Mishkan, at all? The answer may lie in the two Ohel Moed structures the Jews had in the wilderness. The first אהל מועד was Moshe's tent, and it was for כל מבקש ד', for any individual who sought to meet Gd. After the sin of the Golden Calf, as we read last week, Moshe moved that tent outside of the camp. With the construction of the Mishkan, though, there was a second, communal אוהל מועד. As described in our parshah, the new tent of meeting with Gd was part of the mishkan – in the middle of the camp. The private ohel moed, for individuals, was moved outside the camp; individuals, even Moshe, were unworthy of connecting with Gd in the domain of those who had worshipped the Calf. This Divine denial of entry was the fate of Avraham with Lot, and of Moshe in Egyot. However, the community as a whole could greet Gd in the public ohel moed, the Mishkan, even within the camp. טומאה הותרה בציבור, a community approaches Gd with a power far beyond that of the lone Jew, overriding the impurity of their recent idolatry. The moment when a nation approaches Gd, rising from the ashes of its failings to soar toward its spiritual destiny, has a power which no past calamity could undermine. This image of the Mishkan as a site in which the community of stumbling Man could meet with sacred G-d, in which holiness could be present despite the coarseness of sin, is seen in a nuance of the law of shaatnez. As Jews, we are prohibited from wearing shaatnez, garments which mix wool and linen. Traditionally, we have considered this law a rule above rational explanation, but Rabbi Eliezer of Worms, the 13th century author of the Rokeiach, suggested in a mystical vein that wool represents the purity of the heavenly domain, and linen represents the coarseness of the earthly domain. Normally, we recognize a distance between those two realms – but wool and linen meet in the אבנט, the belt worn by the kohen when working in the Mishkan and Beis haMikdash. Moshe understood that in the Mishkan a community could bond with Gd despite their flaws and errors. Beyond wanting to simply "fit in", Moshe longed to participate in this process. To Moshe, the Mishkan presented an opportunity to join with the nation in their pursuit of national atonement, an auspicious venue in which to bend the curve of heaven a bit closer to earth and elevate the human being to the limits of his plane; this warranted cooperation with a nation that had violated its covenant with G-d mere months earlier. The mishkan unites Jews of every level, from the purity of the heavens to the coarseness of the earth. This is where Moshe wanted to be – not off in his tent, secluded with Gd, but part of the noble, national Jewish experience, building a home for Gd on Earth. Moshe was pained by the thought that he might be excluded from this venture. We wear Moshe's shoes; Jews who observe halachah are compelled to stand apart from the rest of the Jewish community in so many ways. We eat in kosher restaurants and kosher homes. Our Friday night is dedicated to celebrating Shabbos. We dance differently, we sing differently, we learn differently. At the same time, we dare not become Yonah balefully glaring at Nineveh from the distance of his hut, or Eliyahu off in the wilderness complaining to Gd of the sins of the nation. Rather, we are summoned, it is our destiny, to be like the אבנט of the kohen, to work as Moshe did, to find ways to be משתתף, to partner with, the world around us, when they unite as a community in service of Gd. To make our shul part of a Federation, a JCC, a Jewish Family Service, a Limmud. Not because this will win us adherents, but because we see our shul, our mishkan, as a place to bring stumbling man closer to sacred Gd, together. I happen to believe in A.D. Gordon's Labour Zionism; physical work does have a redemptive character – and especially in building up our homeland. But Moshe's message here is not about the physical act of putting up a building. And Moshe is not only trying to defeat the isolation he had experienced for much of his life. Rather, Moshe is articulating a message of sublime beauty: Stand apart as you must - but in the mishkan, stand together, contribute to that noble, national enterprise. In last week’s parshah, after the חטא העגל, HaShem performed the ultimate act of separating Moshe from the rest of the nation: Gd declared, “I shall destroy the rest of them, and inaugurate a new nation with you.” This is it, Moshe – you are going to be the new Avraham, and your descendants will begin again. Moshe dramatically rejected this Divine offer, standing his ground and insisting that his fate would lie with the nation. Moshe saw his spiritual identity intertwined with that of his people, his spiritual home located in the Mishkan that played host to the entire population. May we, in our own mishkan, remain committed to do the same.